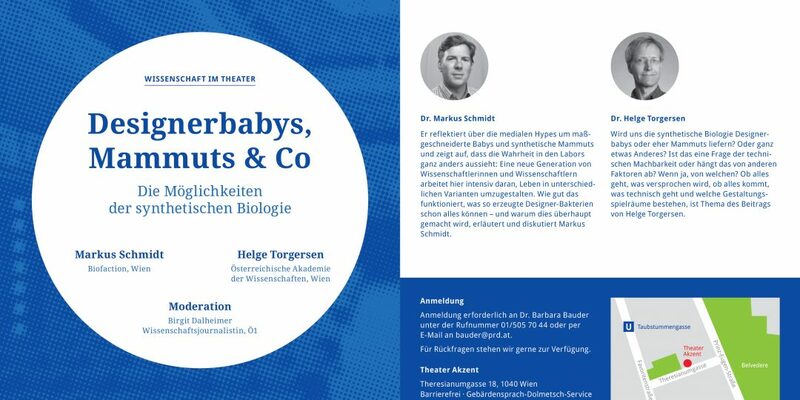 The Austrian Science Fund (FWF) is organizing the talk “Designerbabys, Mammuts & Co”. The talk will take place on 03.04.2019 in Theater Akzent, Vienna. Markus Schmidt from Biofaction and Helge Torgersen from the Austrian Academy of Sciences will discuss about the possibilities of synthetic biology. Markus Schmidt will reflect about the hypes in the media like designer babies and resurrected Mammoths and talk about how the reality looks different in the labs. He will share his insights about how a new generation of scientist are working on the ways of designing life.